The new year is coming quickly which prompted people asking me what my New Year Resolutions will be. I thought about going to the gym but that’s not going to fit into my lifestyle. I thought about playing an online game but I think those days are over for me. Then I thought about giving up meat. I really doubt that’s going to happen. I finally watched Sweeney Todd and and I’m in the mood for meat pies. Speaking of meat pies, I really like Peasant Pies in San Francisco. Not that Peasant Pies are putting people in their pies, just that I think they have really great tasting pies. Visit one of their stores if you’re in the mood for a pie. This year I’m making a geeky list of things I want to do or get done. Use more interrobangs. Interrobags are used after a question with a little excitement like, “Really? !” The only problem I see is trying to find the fonts that have interrobangs. But other than that, I already use the ?! combination. 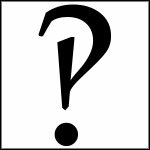 I think all I need to do now is configure Word to autocorrect that combo to make an interrobang. Transition from Photoshop to Illustrator to do more of my graphic work. I’ve been using Photoshop since 1996 and I’ve been told that I’ve been using the wrong tool. I should be using Illustrator. I’ve seen what it can do and I can do some of the simple functions. I tried some online tutorials but I think I really need the basics. Maybe there’s a guide out there to go from Photoshop to Illustrator. Please send me a link if you know of an easy way to transition. Use single spaces after periods. I was listening to Grammar Girl the other day and she said that kids in school are taught to only put one space after a period that marks the end of a sentence. She said that the only reason that people put two spaces was for the formatting of documents when they were written via typewriter and people needed the extra space to show that it was the end of a sentence. With computers and the ability to changes fonts we don’t need to do that anymore. The fonts we use today put a decent amount of space at the end of a sentence. However, I’m not sure how this is going to work with the fonts that try to replicate a typewriter. Just three resolutions for now. I’ll probably update my blog with more resolutions as times gets closer to the new year.